It’s rather surprising that a recipe for Potato Bread hasn’t yet been featured here. I’ve long been a proponent of this frugal root vegetable, so this is a truly inexcusable oversight. Indeed, the entire concept is one that is incredibly appealing; it’s clear that this is one loaf of bread that is going to possess flavour in prodigious quantity, in addition to a moist, pleasurable texture. Happily, this is one recipe that doesn’t disappoint, not that my recipes tend to do so, and is the perfect accompaniment to any soup or casserole. Potato really ought to be more frequently used in baking, since it can easily bestow the moisture craved by the majority of the baking community, whilst allowing one to maintain a certain frugality. Indeed, it has rather impressive applications in cake baking – a rather intriguing prospect, I’m sure. Potato also happens to be an exceptional vehicle for flavour, a trait shared by most basic sources of carbohydrates. However, it also has a characteristic that succeeds in placing it, in my opinion, far above its counterparts – it can be at once both innocuous and integral to the flavour of one’s culinary creation. Now, it must be admitted that the delightful Delia had a significant hand in the formulation of the recipe you see before you. Of course, the recipe hasn’t been ripped off, but no one wants this to develop into an awkward case of blatant plagiarism. So thank you, Delia – though your savoury dishes may fail to ignite my desire, your baking certainly succeeds in doing so! Whatever the source of this recipe, ultimately it is one that can be enjoyed by all. Alas, I have one more admission to make – Katherine produced this exquisite example of bread making, not I! There simply wasn’t enough time in that particular day… there never is. One could say that time can be rather frugal. 1. Put the flours, salt, chilli flakes and a twist of black pepper into a large mixing bowl. Peel and grate the potato into the flour mixture. 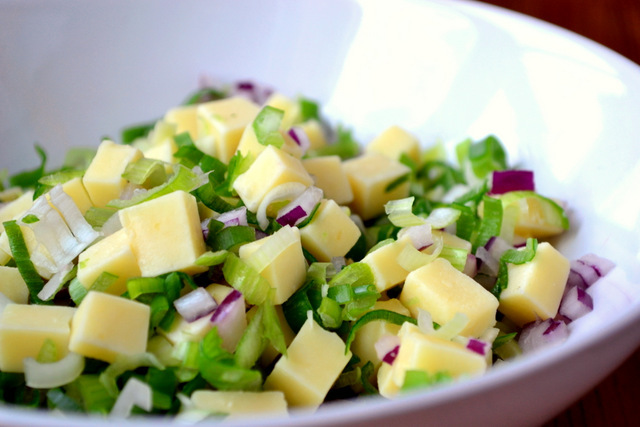 Add the onions, parsley and the cheese. Preheat the oven to 190C. 2. Beat the egg and the milk together and pour it into the flour and potato mixture. 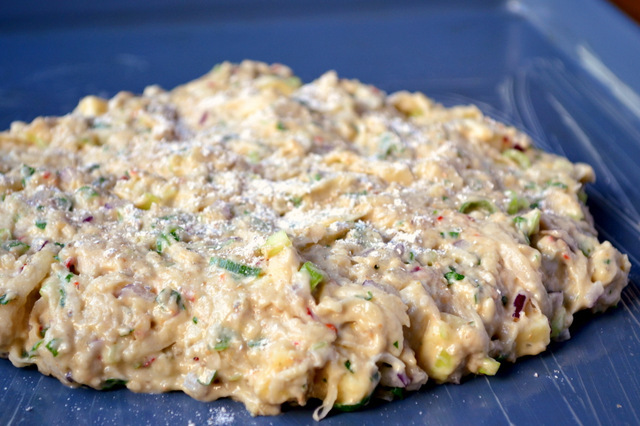 Bring it all together to form a rough dough. Transfer it to a floured baking sheet and pat into a loaf 6 inches in diameter. Dust with a little extra rye flour. 3. Bake the bread for 45-50 minutes, until golden brown. When done transfer to a cooling rack and eat when still warm – though it is fine to eat for the next two days. Cost: I’m going to come right out and say it… this loaf should set one back no more than £1.20. Potato truly is the embodiment of the word frugality, is it not? Please do – it really was delicious. Haha what? I actually made this last week, and it was super good! More like a pie even and not bread! I love potato breads! What a stunner – I hope Katherine has received plenty of her due praise! Please do – utterly mouth watering. That looks terrific! I’m wondering if some slices fried in the bacon fat while you are cooking breakfast might make a nice addition to one’s plate? Thanks! Yes, I suppose so, but it’s entirely unnecessary. 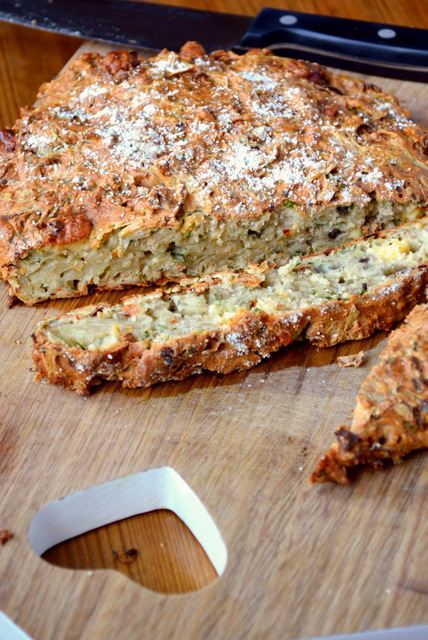 it looks delicious, never knew you could make bread out of potatoes…. I presume it is rather filling? what would you have it with? Thanks! Oh, you can make anything out of potatoes! Yes, very filling – served with either soup or butter… or both. Even the gratuitous raw ingredients shot looks tasty :). Kudos to Katherine…that looks like rustic frugal loafy goodness to accompany a delicious hearty soup to me…well at least that is what I am going to use it for. Potatoes are wonderful and we use them all the time. They are dirt cheap here at $6.95 (4 pounds 54p) a 10kg sack but Tasmania does grow a plethora of spuds as we have a similar temperate range to good old blighty. My favourites are kipflers and pinkeyes (both sound like painful diseases 😉 ). Haha – it is a must, an essential part of the blog mechanism. She did very well :D. I;ve actually never made this loaf myself! I think they are cheap everywhere, but that is VERY cheap! Something VERY cheap that tastes that good is to be treasured! Placed reverently in the special folder where you go to time and again for simple sustenance when the real world has scooted you a bit further along in your day than you realise. OH, indeed! I’m happy that my recipes are revered! Thanks – it very much was. An amazing looking loaf. Kathryn indeed needs our praise. It is slightly problematical for me to read your posts half an hour before dinner. My sincere apologies to you and Katherine. I have a friend who spells it the other way and was not paying as much attention as I should. You are too kind. My surname “Bofin” is very unusual and I am used to people getting it wrong. I often find myself saying “Call me anything you like, just don’t call me too early in the morning.” or such like. Though, somewhere deep down, it irks. How do you pronounce it? Is its etymology French? Very interesting! I’d never heard of Brian Boru – I shall read up on him. Holy Yum! 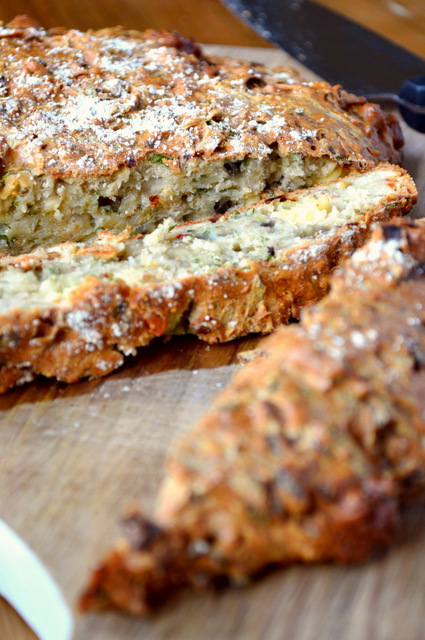 I am not much of a baker, and have only made bread once… But I need to make this, it sounds and looks divine! I love potato bread but I usually make it from left over mashed potato so I was very interested to see your recipe! That’s not a bad idea – I’ll have to give it a go. This sounds and looks great. Yes – will make this! This looks so moist! I have to make this for Christmas! oh wow!! Awesome looking bread!!! Thanks 😀 – it was so delicious! I’m sure the bread is tasty. The chopping board is special too!! Haha – thanks – mine too 😀 You too, Celi! Love the pic of the cheese and veg! I am so psyched to try this! I am always on the look out for yeast free breads – I can’t have yeast, shame, I know. And add to that, I’m always on the lookout for cost effective ways to eat well. Eating well does not have to equal LOTS of money; it can of course, as with anything, but it’s really not necessary. Plus, I love potatoes and cheese! This looks sensational! Every single ingredient in the bread is delicious. The aroma inside your house while the bread was baking had to be wonderful! Well done my friend! Want to eat that NOW! More good food from you. I haven’t had a chance to make your last dish yet. That bread looks so good. I love cheese, onion and potato, I’m going to have to give that recipe a go! Will be making this for dinner tonight! Thanks. It was lovely! More bread-like than I imagined and so easy to make. Thanks. Thanks! Yes, it is bread like, but very dense in a pleasant way. Yum! I want to eat this right now! *Clap, clap* because this is SO amazing! It looks fantastic! I would definitely attack the corner first! Poor corner not even featured in the photo! Yessss, a clap :D. Haha – I’m cornerist. I plan to try this today… to eat with lovely pea soup. Oh wow, this looks yummy! Adding it to my recipe collection — thank you for sharing! Thanks, Stephanie! I hope you like! Yum! I love baking with potatoes. This looks like pure comfort food. Oh it was, it really was. My Dad liked the potato bread from the local bakery when I was growing up, but it was nothing like this! It just looked like another white loaf to me. Now this is what I call potato bread, and then some! Yum! i think I need to go make some potato bread now! 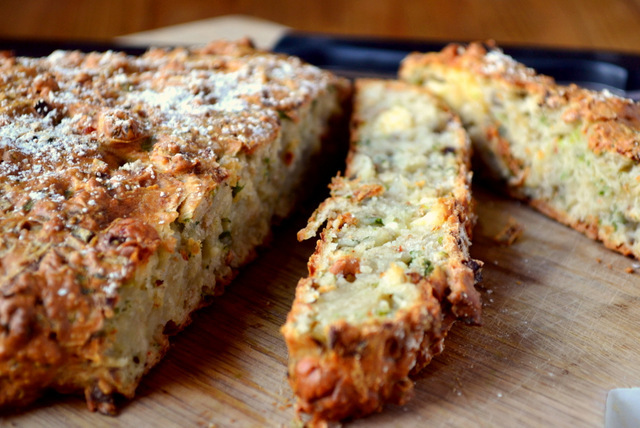 Wow, that is just glorious….I have never seen potato bread like this! Yes, do! Give it a go, no kneading needed here! I have to make this recipe. Thanks for the post. You must 😀 No problem! Potatoes.. yes they are the ultimate in frugal, Frugal:) But now with two of you baking, will it be frugal i and frugal ii? ps Congrats on 3,000!! Wow!! They really, really are! Haha – she’s not allowed to do too much :D. Thanks!